Diana Damian Martin finds that the Tate Modern’s exhibition imposes an “obscure, totalising framework” onto the complex interplay between performance and photography. Ekaterina: Mariage à Loèche-les-Bains (Marriage in Leukerbad) 2012. Photo: Romain Mader / ECAL. 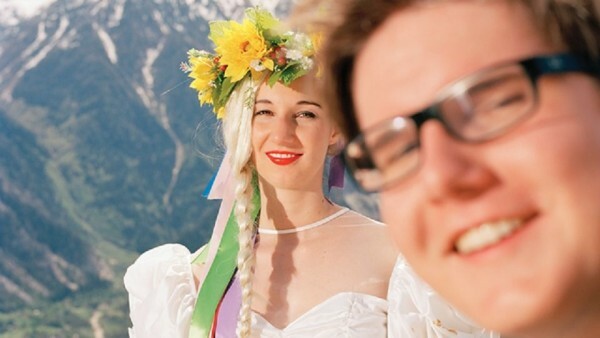 They look like the Alps – picture-perfect snowy peaks, melting into green pastures; in the foreground, a bride, all puffy sleeved and crowned with flowers; and to perfect this beautiful kitsch, a man is photo-bombing the picture, all blurry and awkwardly cropped. This is the poster for Performing for the Camera, which features Romain Mader’s Ekaterina: Marriage a Loeche-les-Bains, part of a series of works in which the Swiss photographer documents an imaginary search for his future wife in Ukraine. In this theatrical staging, the camera is presented as the agent of the day to day, and Mader its flippant author. Mader is drawing in equal measure on the social as much as the aesthetic, positioning them in dialogue in a photograph that acts as contemporary iconography (though maybe it’s a bit more deliberately dated than that). Mader’s is a telling image for the complex identities that Performing for the Camera attributes to photography – site of and for performance, for play and for conflating the public and private, the formal and the everyday. It also acts as an exposition for the exhibition, representing in equal measure the flippancy with which the topic is approached throughout, and exposing its politics too. The deliberate, staged confusion of Mader’s photograph, in terms of its identity and authenticity as an image as much as that of the characters presented, becomes a verdict for Performing for the Camera: an exhibition that approaches both performance and photography with a problematic lack of agency. Performing for the Camera proposes that photography, in its navigating of the public and the private realms, the artistic, documentary and domestic, is aptly positioned as a conceptually-rich, imaginative context for thinking about representation, subjectivity, identity politics and authenticity. Structured thematically, from photography as document through to portraiture, iconography and public relations, the exhibition presents an impressive, exhaustive range of works spanning 150 years. We jump from Man Ray to Andy Warhol, Babette Mangolte to Joseph Beuys, the Nadar Studio to Carolee Schneeman; we encounter the intricate narrativity of Eikoh Hosoe’s photography, Happenings from Yayoi Kusama and Yves Klein, the sparse, poetic technicality of Yvonne Rainer and Merce Cunningham, and the sharp, playful portraits of Francesca Woodman and Cindy Sherman. From camera obscura to Instagram, this is the territory of the real and imaged. These art histories from across the continents – Japanese Fluxus and early European photography portraiture- are fused together in a journey that attempts to trace similarities in different conceptualisations and uses of photography (and of course, our end point is Instagram). What this does is expose some of the ways in which photographic space has been used since the 19th century; but it also depoliticises that space, creating a sameness between these different works that erases their most intriguing dialogues with performance. This also becomes apparent by the lack of interest in contemporary photography that deals with performance in overtly playful ways – like the work of Manuel Vason or Hugo Glendinning. This omission seems glaring only because of the mapping exercise which the exhibition’s curation undertakes; here is an endlessly intriguing collection of works, an archive that speaks to art history as much as it does to fragmented histories of performance and identity politics. At the same time, and despite this remarkable archive of works, little discussion surfaces about the relationship between photography and performance per se, because the boundaries between the two are kept confusingly loose. Sometimes, we get a glimpse of process, as is the case with Yves Klein’s iconic Leap into the Void, which sees the artist jump from the first floor of a building; in the exhibition, we see the photographs that composed the image – a net to catch the artist’s fall, and photographers taking active part in its staging. At other times, the labels leave little to the imagination, and omit any context that might help attribute the image its context, or allow multiple interpretations of its form. Such is the case with the beautiful photography of works by Merce Cunningham or Yvonne Rainer. Performing for the Camera returns to questions throughout: who is the author of an image when it depicts artistic process or documents its eventness? What does it offer to performers as a medium? And how has it developed over time? But what it fails to do is provide an entry point into the myriad conversations shaping performance and photography: the presence of the photographer and its impact on artistic work; the blurring of boundaries between subject and object; the challenge to photography’s seeming neutrality, or its pervasiveness in contemporary visual culture, its shape-shifting identities. The exhibition instead is limited to sampling rather than representing, and this sampling undoes the work of its artworks; this is not just a matter of what the photograph does with and through performance, but the ways in which the two mediums blur, de-instrumentalise each other, and engage in complex dialogues on the nature of representation, authorship and the document. Performing for the Camera troubles its own material not through curatorial authorship, but by treating performance as a kind of pretence, allowing the theatrical and staged to fold into the performative and authentic. When you work with performance simply as a mode of being or viewing, and not as a practice in and of itself, you also waste photography’s endless potential of subverting representation, of playing with authenticity, or granting status to the invisible. As Susan Sontag argues in her essay On Photography, a photograph ‘is not just the result of an encounter between an event and a photographer; picture-taking is an event in itself, and one with ever more peremptory rights – to interfere with, to invade, or to ignore whatever is going on.’ Whilst moving between modernism and the avant-garde, the staged and the authentic without any clear pathway, Performing for the Camera disables its material from performing its identity, or responding to its context. The photographic works seem to collapse onto each other, without any room to breathe. Aesthetic experience shifted with the advent of photography, alongside new directions in representational politics across the arts; but this also led to an inherent relationship between economic structures, reproduction and visibility. Performance has a complicated relationship to photography, which has made possible the perseveration and representation of a range of live practices, and brought visibility to the unseen and unspoken. What happens, then, when the museum performs both a restaging of art histories, thus granting them visibility, and a homogenisation of their specificity? I am reminded of a recent article written by artist Hito Steyerl, A Tank on a Pedestal: Museums in an Age of Planetary Civil War in which she concludes by arguing that ‘history only exists if there is a tomorrow. And conversely, a future only exists if the past is prevented from permanently leaking onto the present and if Mimics of all sorts are defeated.’ She continues by saying that ‘museums have less to do with the past than with the future.’ This is an important argument, because it provides a reconsideration of archives as spaces of conservation that seek a fixed meaning, in stasis. By blending social media with documentary practices without looking at the implications for the materials at hand (some which seek to do this explicitly, perform that critique themselves), Performing for the Camera creates an obscure, totalising framework on a set of works that speak so powerfully to our relationship to the camera, as well as to the formal and political implications of preservation, subversion and deliberate deceit. What is at stake in these images is not solely the realm of the conceptual or the subjective; the image is not solely reproduction, but it treads fine lines between expression and exclusion, private and public. What the works in Performing for the Camera attest to is not the power of the selfie, but the ways in which it is impossible to simply conceive of photography as neutral, or performance as something for an audience. What the curation of the exhibition does is to erase the difficulty in these images, and their dialogues with subject matter or form. After all, not all viewing is narrative, and not all narrative is historical. As is the case with other recent programming featuring performance at the Tate (Painting after Performance, for example), there is a problematic rendering of the subject as a lens rather than a set of critical practices. This is a dangerous institutional gesture in the age of neoliberalism – a conquering of history and a homogenising of art’s most difficult, evasive and subversive encounters. Performing for the Camera is on at Tate Modern until 12th June 2016. Click here for details.